In case being a fast-food employee wasn’t hard enough, KFC is now putting its workers through a bizarre initiation rite: a creepy BioShock-esque virtual reality “escape room” replete with narration from an omnipresent, mildly demonic-sounding Colonel Sanders. Cool! Per a press release, the chain is incorporating the VR environment — experienced via Oculus Rift headsets — into its employee training program to show trainees how to make its signature Original Recipe fried chicken. 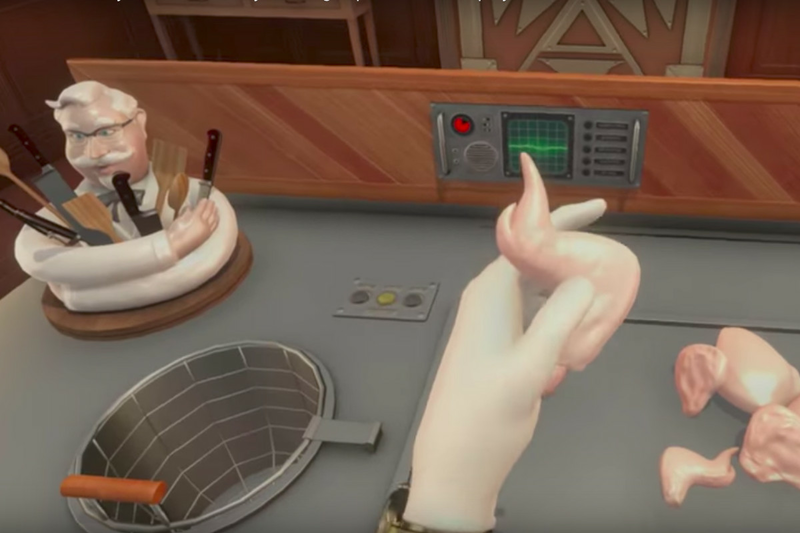 In order to get out of the virtual escape room, employees will have to play as a pair of disembodied hands to demonstrate (virtual) mastery of the five-step cooking process — inspecting, rinsing, breading, racking, and pressure-frying — all the while being cajoled by a cackling Colonel. But why? The press release notes that this VR exercise takes workers through the chicken cooking process in just 10 minutes, as opposed to the 25 minutes it takes IRL, so perhaps the idea here is to speed up the training process (and to avoid potentially wasting product). Or hey, maybe somebody at KFC HQ just got a really good deal on a whole pallet of Oculus Rifts. KFC has delved into plenty of weird tech recently — see the takeout box that also functions as a phone charger and the chicken bucket that incorporates a photo printer — but those are typically limited availability items that serve more as publicity stunts, rather than demonstrations of new technology the company is actually incorporating.